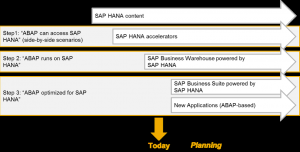 The SAP CCoE turned 18 – has it come of age? What do you get if you mix SAP with Agile and Lean IT…? How to start the implementation of an Advanced CCoE? Wondering what the most efficient approach is to start the implementation of an Advanced SAP Customer Center of Expertise (CCoE)? SAP today unveiled SAP HANA Enterprise Cloud, a new deployment option for SAP Business Suite powered by SAP HANA. The new offering enables companies to run mission-critical SAP ERP, SAP CRM and SAP NetWeaver Business Warehouse applications as a managed cloud-service on an petabyte-scale platform. SAP Release Strategy 2013 – Available Now! 2-hours HANA Essentials training very well received!